* Student life is extremely busy and you are always short on time. Finding ways to study faster and smarter is the key to productivity and better grades. * Whether you need to quickly scan a reading before heading to class or want to study in short-bursts throughout the day, the Chegg eReader can help you study more efficiently. 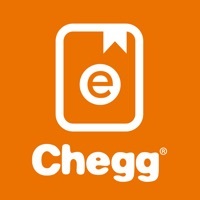 * With the Chegg eReader you can study anytime and anywhere by accessing eBooks purchased on Chegg.com across all your devices (mobile and tablet). * All the eBooks you've purchased will be available in one convenient location. 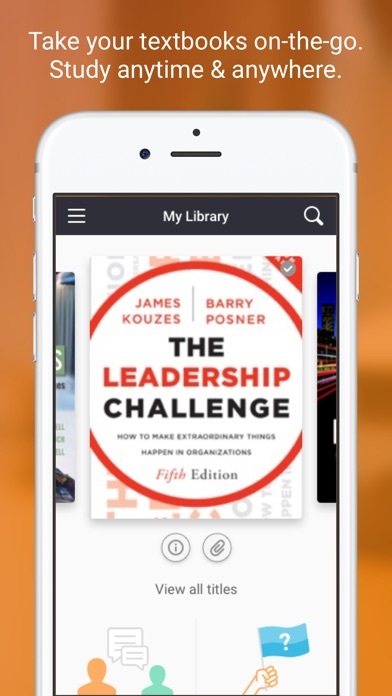 * You can use the live filter to search for the particular book you are looking for. * You can also download your etextbooks directly to your phone or tablet to avoid streaming. Features: In you ebook you can easily access the table of contents and skip to various chapters, specific textbook figures and diagrams and notes you've made. Take notes directly onto your eBooks. 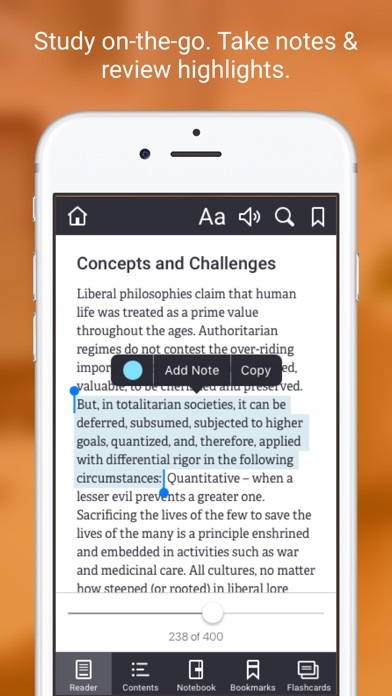 Whenever you have free time to study, simply open the Chegg eReader and review your notes. Highlight directly on to your eBooks. 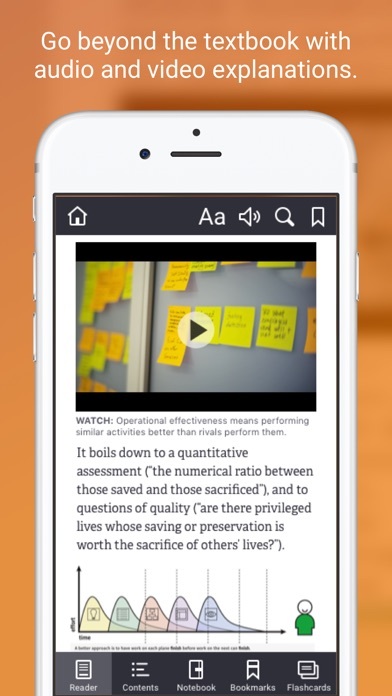 Whenever you have free time to study, simply open the Chegg eReader and review key concepts. Unable to turn page on iPad to go to next page, have to use scroll and it jumps chapters.. works fine on Samsung phone but to tiny to read for long periods of time. The pages are not the same so when a professor gives you page numbers to read from you never know where they are because the ebook page numbers are not the same as the physical textbook. Why, when I search and click a result, does it not ALWAYS take me to that result? It’s making studying soooo time consuming! Chef has made buying books, studying and more som much easier. It’s such a great tool to have and wonderful resource across the board. Only 4 stars because of the lack of leaving off somewhere or bookmarking on one device and not being able to pick back up on another de ice. How do I even get the textbooks????? I’ve clicked everything but I can’t seem to find any type of book whatsoever! I purchased an ebook and was hoping I could view it via the app, but cannot access it all. I can view it on the mobile site and my desktop, but I’ve tried with the app, clicking everywhere imaginable to no avail. I can’t even leave feedback on the app cause that feature isn’t working either! I bought a book through Chegg and have never been able to open it. Have contacted customer service three times and each time they say tech support will look into it and contact me back and they never have. It’s now been over a month, and my book has never worked on this app. The only reason I bought the book through chegg was to use the app. You can’t even submit feedback on bugs because the submitting function is bugged. Horrible app. This app is useless. I have followed all the articles relating to opening my textbook but it has not once opened. My internet connection is great and I have the most recent version downloaded. I can only guess that the majority of these reviews are paid for by Chegg. I enjoy the app because it’s not trying to be too much. It functions well for its main purpose... reading. There are two features, however, that I feel should be added/improved upon: 1) Margins: Maybe it’s just the specific textbook I am reading but I can only adjust the text size and not the margins. As of now, the text goes to the very edge of the screen. 2) Text Selection: The app seems to use their own version of text-selection compared to the native iOS text-selection feature. While it’s not hard to use, it’s a bit finicky at times. Hard to be precise all the time because you can’t quite see what you are selecting as your finger gets in the way. Overall though, the app performs excellent as a simplistic e-reader as intended! I had no particular feedback for the app until I was interrupted while using it. I purchased the etextbook 3 weeks ago and I still can’t open it. I click on it on my iPhone or iPad and nothing happens. I paid for the option to use it offline but I can’t access anything. When I looked for the answer online I’m directed to the Chegg website but it will not allow me to see the answer to my question unless I pay an additional fee of almost $15 dollars. That’s BS! On top of that I now read a review that we can’t take notes on it using an iPad and pen or view it in an app that does allow us to use iPad accessories. What a rip off. Easy to use as a eReader. But for the purposes of school I wish I could use my Apple Pencil to write notes. It would allow me to be way more engaged in the material. Five star not true... I have downloaded the Chegg ebook app and it will not download. What is going on? I just paid for an ebook from chegg that I can’t read now. Every time it tells me to log in which I do it just stays on a black screen with the chegg logo on it doing absolutely nothing. It just keeps having me sign in over and over and over again. This is ridiculous. I should not have to sign up for a Twitter or Facebook account to get assistance. There should be a customer service number for help. I am truly unhappy 🙁 with this situation. As far as being able to see words on a screen it does that job really well. However, as being a replacement for a book. It is terrible. Taking notes is impossible if you plan to do so without paper. You can not take notes on screen without having to switch to a note taking app, you’re limited to amount of pages you can print(two at a time.... I did PURCHASE the ebook right? ), taking notes using what’s available in app is not ideal for me, I tried using ebook on a surface and iPad. Let me tell you, not being able to use the pens for their respective devices is really really bothersome especially since I was ideally forced to purchase the ebook from chegg or pay over $100 more from amazon(ridiculous right). Im a college student of course I am most likely to take the cheapest option. But if I could do it all over again I would pay the extra money to be able to use a different eReader than the one chegg offers. Being unable to utilize my iPads feature is a disappointment. I have spoken with my classmates also and several feel similar about this. I understand the practicality of a computerized voice, however, it is difficult to follow.. it would be more beneficial to have a human voice with proper tone and flexion. It crashes when needed. It’s also inconvenient when you’re signed in with one device, and says you’re maxed out and can’t read your textbook anywhere else. 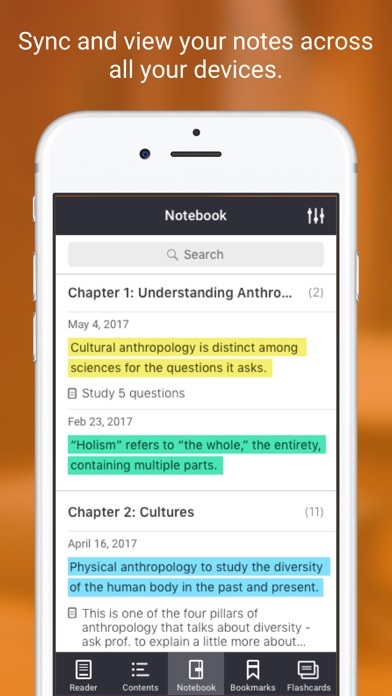 I was able to get upload my other textbook from another store into GoodNotes and swipe, mark, and do as I pleased with it. The other book I needed was not available so I got it from it Chegg. This app is extremely slow and does not work with my iPad Pro very well. Guess I’ll deal with it this semester, but never again. I’ve been trying to get to my textbook on this app. I can use it perfectly on my laptop, the textbook on my iPad is taking a while to load and is constantly stuck loading. Frustrating and annoying. I have one minor issue with the reader. I can’t scroll to the bottom of a page. When i scroll all the way down, if i want to see the last 2-3 lines i have to manually hold my scroll up if that makes sense. Could be user error or maybe my phone but it’s a bit annoying. I do most of my reading on a PC or laptop anyway so this is the minorest of minor complaints. Otherwise great app from a great company. Wish you didn’t have to hold down then press highlight. I wish there was a pencil/highlighter options and then you can just slide and highlight what you want. I have only been using this app for a couple of days, but there is already a couple of things that I think need improved that keep it from being a good app. The nice thing about the app is that it makes carrying multiple textbooks much more bearable throughout the day and is really nice to study when you have only a little time between classes. The other obvious plus is the price break on the ebook compared to traditional textbooks. What I really don’t like about the app almost outweighs the good though! 1.) There is no support for the Apple Pencil on the iPad. This makes it very cumbersome for annotating and highlighting sections of the book while reading. This is my main grip! If it wasn’t for this it would be a much better app. I didn’t spend over $1000 on an iPad Pro to be tied to a keyboard! 2.) It seems that you cannot change the name of book marks after you select one. It just gives the generic name of the chapter and page, but this is unhelpful for finding exactly what you’re looking for or what you book marked. 3.) The read to text function could be really awesome, but it sounds very digital. The app says you change the voice and directs you to settings, but after you change the voice for the iPad in the settings it doesn’t actually take effect within the app and continues using the same robotic voice. On my phone, no matter the setting, the page won’t fill the screen. This is not a problem when I zoom in, but it’s really annoying that you then have to zoom out to swipe to the next page. Hopefully it’s just a bug or formatting issue and it’s fixed soon because I do love that I got the ebook for 7 days free while I wait on my copy to get here. I used this app last semester to read a rented text book but something has gone horribly wrong since then. My new book would not show up in my library regardless of how much I hit refresh. I ended up deleting and reinstalling the app to fix this. As of this writing I’m still in unable to access my book and it’s not clear if it’s downloading or not. I tried to leave an in app review but guess what, that feature doesn’t work either! This app would be perfect if it had support for the Apple Pencil. It’s so unnatural highlighting with my fingers. Pretty disappointed in my e-book at this time. I decided to download e-books from Chegg instead of textbooks because I wanted the ability to study and read while traveling and at work. I can’t get my book to download or even open the way app says it should. Not sure if I’m able to get my money back for the e-book and get a textbook or what to do at this point. Just disappointed. I loved how cheap their ebooks are and I prefer ebooks due to the ease of always having them. However, this reader is such crap. It takes a while to even turn pages which is frustrating when you have “downloaded” the book to your phone. The Chegg eReader stopped working. Frustrating! I have to uninstall and reinstall. Get a physical copy of the books. The page numbers are not listed as they are in the books. For example, The Writer’s Reference book has many small pages, the ebook version lists multiple pages in a slide. It keeps freezing on my iPad and iPhone during class. Have to close and reopen app every 15 min !! I love everything about this app it’s downright convenient but for some reason it keeps glitching... it started around October 19 can you guys fix this by any chance?? Missing solutions to fundamental problems chapters 1-11. I should have rented a physical copy instead. The most annoying part of this app is having to scroll ALL THE WAY DOWN just to turn the page. I was only able to download this on my phone. I have a 3rd generation iPad and it wasn’t compatible bc the iPad was too old. Which is annoying bc my iPad functions well with everything else. It’s annoying to read a textbook on a phone screen. I like ereader Chegg for the simple fact the price for an e-book was much less on chegg online, than renting a physical copy. HOWEVER, it’s now a catch 22 because I honestly prefer a physical book: -ease of highlighting -less strain on the eyes -physical pages to turn (especially when taking open book tests) Just without the physical price (school textbooks are expensive af!). So I decided to print the chapters from my current text book: The Policy Based Profession (6th Edition). This has been a headache because: 1) I feel like I’m having to buy ink weekly! 2) i feel like I’ve having to buy sam’s club size packets of print paper 3) the publisher only allows you to print out TWO pages at a time, which means one page could very well have only THREE sentences on it, which is a complete waste of paper. I’m hoping this can be fixed. If not then I’ll just go back to physical books and pay the extra money on the front end to rent, so I’m not having to pay extra money on the back end and wasting resources to print e-book pages because just like books aren’t cheap, neither are printer ink and paper! 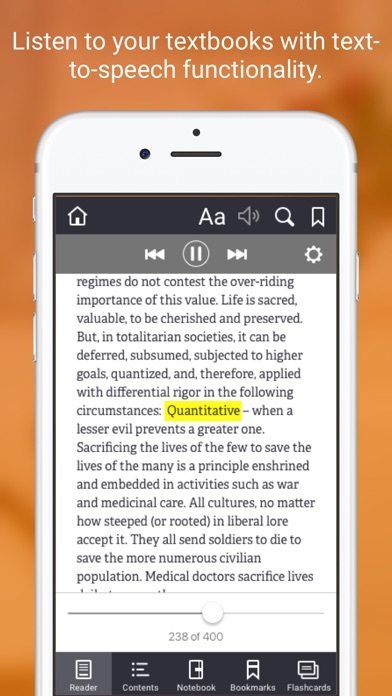 This is a really handy app, as I much prefer to read textbooks on my iPad. The only thing I’ve noticed that could be better is that it is harder than it should be to turn pages. I love this app! It has made reading my online textbooks and taking notes SO much easier. I use the app on my iPad and really enjoy it. App itself works really well, but my phone becomes extremely hot shortly after I begin reading on it. The voiceover was a little annoying. The material would have been easier to follow if the voice was a little more inviting and easier to understand. However I do appreciate the feature. This app currently is very nice. It does what it needs to do and I haven’t had any issues with it. However, I do have some suggestions into making it a phenomenal app that many would be drawn to. I think it would be fantastic if it was compatible with the Apple Pencil so we could draw on it. That would be great and I would probably get all the textbooks on there I could. Overall I’m happy with the app, but after downloading the text book when I turn the page it takes a few seconds to load. Since I downloaded the book I would have expected all of the pages to already be loaded for fast flipping. Also, the voice used for reading the page needs to be updated. It sounds like a robot rather than a person, and it reads the word based on how it’s spelled out, not how it’s supposed to be pronounced. Or maybe allow the option to use the voices that apple has?